The South American rodent Octodon degus (degu) may be a promising candidate for physiologically modelling sporadic AD, as it was reported to develop the ‘full range of AD-like pathologies’  without any genetic manipulation. While wild degus have only a limited life expectancy (mean: <1 year; common max: 3–4 years), captivity lowers mortality and increases mean life span to 5–8 years  (Ebensperger L.A. & Hayes L.D., unpublished data). This captivity-dependent, aged phenotype combined with the highly homologous Aβ sequence , differing only in one amino acid from human Aβ (see Fig. 1b), might be the main reasons for their vulnerability. Thus, during the past years wild-caught and captive born degus were used in AD research [12, 13, 14, 15] and have been referenced in numerous review publications [10, 16, 17, 18, 19, 20, 21, 22]. In this course, prominent intra- and extracellular Aβ deposits were reported in cortical and hippocampal areas of aged animals (>3 years) [12, 19]. 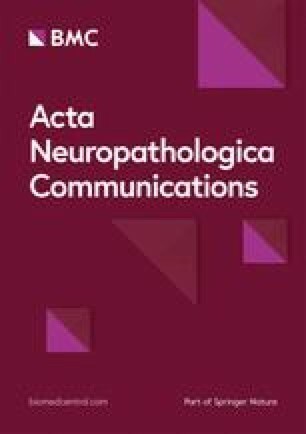 Furthermore, APP and Aβ positive axonal bulbs were observed in hippocampal white matter tracts of old animals (6 years) which preceded cerebral amyloid angiopathy . Biochemical analysis of aged degus (5-years-old) indicated a correlation between Aβ*56 oligomers and tau phosphorylation on the one hand and decreased synaptic plasticity and impaired memory performance on the other hand . However, the most recent study, analysing young (1 to 3 years old) and old animals (4 to 6 years old), found AD associated autophagy markers LC3 and p62 unchanged . Furthermore, GFAP (glial fibrillary acidic protein), CD11b expression, oxidative stress and apoptosis markers were unaffected in cortices but elevated in hippocampi of old animals. Cortical and hippocampal levels of AD-linked IL-6 seemed increased in old degus . Animals were sacrificed by cervical dislocation and immediately perfused with 50 mL PBS followed by 50 mL PFA for fixation. Paraffin-embedded, 4 μm-thick coronal sections were deparaffinised and stained using Haematoxylin and Eosin. Immunohistochemical analyses were performed using Bond-Max™ (Leica Microsystems, Wetzlar, Germany) automated staining system as described previously [5, 26, 27, 28]. Epitope retrieval was carried out as follows: 5 min in 95 % (v/v) formic acid for 6F3D, 4G8 and 6E10; 20 min in EDTA buffer pH 9.0 for IBA1 and AT180; 10 min enzymatic digestion (Bond Enzyme Pretreatment Kit, Leica Biosystems Nussloch, Nussloch, Germany) for GFAP or 20 min in citric acid buffer pH 6.0 for NeuN, AT8 and AT100. Antibodies against ionized calcium-binding adapter molecule 1 (IBA1 1:1000, 019-19741, Wako Chemicals, Neuss, Germany), glial fibrillary acid protein (GFAP, 1:500, Z033401, Dako Deutschland, Hamburg, Germany), neuronal nuclear antigen (NeuN, 1:500, MAB377, Merck Chemicals, Darmstadt, Germany) phosphorylated tau (AT8, 1:50, MN1020; AT100, 1:500, MN1060; AT180, 1:50, MN1040, Thermo Fisher Scientific, Waltham, MA, USA); β-amyloid (6E10, 1:100, SIG-39320, Covance Research Products, Denver. PA, USA; 4G8, 1:2000, SIG-39220, Covance Research Products, Denver. PA, USA; 6F3D, 1:100, M0872, Dako Deutschland, Hamburg, Germany) were used according to manufactures instructions. Slides were developed using Bond™ Polymer Refine Detection kit (Leica Microsystems, Wetzlar, Germany). For Campbell-Switzer staining, paraffin-embedded, 4 μm-thick coronal sections were deparaffinised, stirred for 5 min in ammonium hydroxide and washed twice in distilled water for 1 min. Sections were incubated for 40 min in Silver-Pyridine-Carbonate solution (14 % (v/v) pyridine, 0.49 % (w/v) silver nitrate, 0.37 % (w/v) potassium carbonate) followed by 3 min in citric acid and washed in acetate buffer (33.6 mM sodium acetate, 14.4 mM acetic acid, pH 4.99). Sections were developed in developer solution (236 mM sodium carbonate, 12.5 mM ammonium nitrate, 5.9 mM silver nitrate, 1.7 mM tungstosilicic acid, 0.87 mM formaldehyde) under a light source for about 6 min. Sections were washed three times in acetate buffer and once in distilled water, each for 30 s. Sections were finally placed in 0.5 % (w/v) sodium thiosulfate solution for 45 s, washed twice in distilled water and subsequently mounted. Slides were digitized using MIRAX MIDI Scanner (Carl Zeiss MicroImaging, Jena, Germany). The scanned slides were processed using the free Pannoramic Viewer software (3DHISTECH, Budapest, Hungary), and analysed under blinded conditions using either AxioVision (Carl Zeiss Imaging Solutions; Munich, Germany) or ImageJ (Wayne Rasband, National Institutes of Health, Bathesda, MD, USA) and the ITCN plugin (Thomas Kuo and Jiyun Byun, University of California, CA, USA). Furthermore, the single amino-acid-difference between degus and humans at position 13 (histidine to arginine) affects a histidine residue (His13) which is crucial for aggregation and toxicity of Aβ. His13 is involved in early N-terminal β-sheet formation  and a substitution lowers aggregation propensity , neuronal binding , and cytotoxicity . Moreover, His13 is involved in the coordination of metal ions  and methylation or substitution by arginine, as seen in degus, lowers the affinity for metal ions and thus depletes aggregation [38, 39, 40] and attenuates toxicity [41, 42] of Aβ.